You mean everything, that you downloaded from OH without Face's compilations? Yes, that's right. And Face's compilations are working with respective versions as well. How about an option for Constant Acceleration plans? I use Orbiter in teaching but run it on Mac laptops using WineHQ. It works very well. Only a few things don't work. TransX has always worked great and for the release 7/7/18 TransX2 also now works. Ah excellent. I was always hoping Orbiter + Wine would work on Mac someday. Have you by any chance had to follow this guide? If so, is anything missing there? If something doesn't work, just spit it out. Sorry, no plans for new major features. I'm focused on paying the bills. TransX and TransX2 work great for the latest version (TransX-2018.05.06-VCpp-2016). For a while I had needed a version a few releases prior. Last edited by fatcat; 07-08-2018 at 12:20 AM. I had seen that guide, but couldn't really understand it. 1. Have a standard Orbiter folder with all my addons etc. 3. Click on Orbiter.exe and open with Wine (default). 4. A few launchpad settings makes it render great. I don't use fullscreen or D3D9 Orbiter.ng. But it's just fine this way. Thanks heaps for all your great MFDs. Isn'r Orbiter just the best example of a community working together for no profit. If you wanted me to look at the guide a bit more and check it out I can. Your guide has actually a potential of being included in the Wiki. It couldn't be simpler than that. Only if you care about running the extras, that I mentioned at the beginning. Thanks heaps for all your great MFDs. Isn't Orbiter just the best example of a community working together for no profit. Honestly I'd work more happily on the subject, if I received any donations. I think I will setup a BTC donation address for this purpose. Nobody would be obliged to donate, but it would show the real value of my MFDs. Last edited by Enjo; 07-08-2018 at 08:24 AM. Success is when I have a student that can launch manually, circularise, align, synch, approach and dock. Vessels/Spacecraft: Atlantis (and all stock vessels), SpaceX (Falcon9, Heavy, BFR), DGIV, XR2, SLS/Orion. Delta. MFDs: Launch, TransX, HUDDrawer, ModuleMessaging, Basesync, Burntime, Glideslope, AbsoluteKillRotate, Aerobrake, Camshake, Hover, IMFD, LunarTransfer, Pursuit, Rendezvous, ScramAltitude, OrbiterSound, XRSound. I just installed Lagrange and it does seem to work OK. Direct 3D video devices not Wine. I just downloaded D3D9Client2016-R3b and copied the files into their respective Orbiter folders. Orbiter_ng.exe runs great on the Mac. Last edited by fatcat; 07-28-2018 at 11:26 AM. I forgot, that Andrew linked the VC runtimes statically, so you're all good with his addons. And thanks for the tips on the settings. Hey, I'm here with a problem that exists with the 2010 version of TransX and might exist for the 2016 version (I don't have an immediate way of testing it currently but I'll get right on that and add a follow-up post). Basically, it's an issue with how TransX communicates with Multistage2015. I framed the issue with the devs of MS2015 hoping it was something wrong with their code but they told me to come and present it to the TransX devs instead. 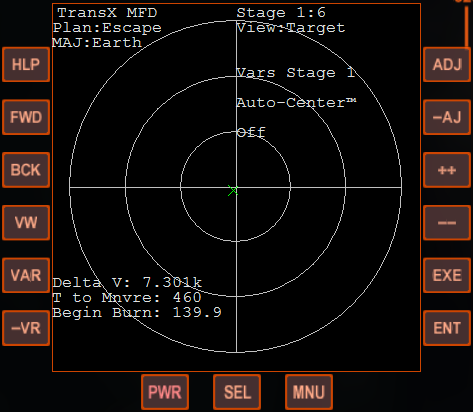 Basically, TransX anticipates a longer burn time with Multistage2015 vehicles, so the countdown timer to the burn is off, resulting in a large error in the escape trajectory. Obviously, this is worse in scenarios that require higher Delta-V burns. In order to fly missions like Pioneer 11 or Voyager 2, I have to save once I'm in orbit, switch the vehicle module back to the old Multistage2 format, and then reload the scenario so I can make the escape burn. The following images illustrate what I'm talking about. I'm sorry if this turns out to be a problem for the Multistage2015 crew to fix on their end, but I was told to present the problem to you. I can confirm that this issue is present in the 2016 version as well, so it's worth looking at. 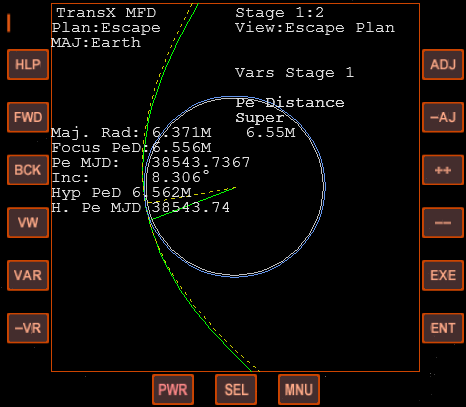 In order to fly missions like Pioneer 11 or Voyager 2, I have to save once I'm in orbit, switch the vehicle module back to the old Multistage2 format, and then reload the scenario so I can make the escape burn. Well this basically sums it up. If it works for the old format, then it means, that the guys changed something along into a form that's incompatible with the old format. Can I first see a link to your post at the Multistage 2015 thread, as a start? The entire conversation is contained on this one page, starting from the second post on this page. Hey guys, I'm here to help with MS2015. I can't understand this issue, I mean why it's happening. Maybe together with Enjo we can work this out. Can you confirm me which parameters of the vessel gets accounted for burn planning? and that should be all, anything else? First notice, that after reading 1987VCRProductions' post in your thread, it seems that BTC calculates this correctly. I've made it so, that both TransX and BTC use the same base class for vessel stack calculation, but apart from this, they diverge unfortunately.